1.3.1.2 Cross-section of the condenser. Condenser system and vacuum equipment are common to evaporators and vacuum pans. Nearly all these vessels use direct contact condensers, where the cooling water comes into direct contact with the vapour to be condensed. In a condenser, we condense large volume of vapour and it will only produce a comparatively small volume of water or (condensate) and this water runs out through the bottom of the condenser down the barometric leg with the waste water. Therefore if we have condensed the large volume of vapor into small volume of water in a condenser, the remaining volume or area must be a vacuum(reduced). Thus we have created a vacuum. With the aid of an air pump or other, vacuum is produced in an enclosed vessel called a condenser, which communicates with the vessels to be maintained under vacuum. Cold water is pumped in to the condenser to ensure condensation of vapour coming from pan or multiple effect evaporator. The Condenser is placed at a height that the water after condensation flow out by gravity together with condensed vapours. The Condenser is a barometric chamber extended at bottom by a barometric column dipping into a well open to atmosphere. s = margin of safety as provision for abrupt variations in level of the water in the column. 0.76 m X 13.6 = 10.33 m where 13.6 = density of mercury relative to water. S is the Safety margin for sudden variations in vacuum or flow in water. It may take in general 0.50 mtr. The cross-section of the barometric column requires simply to have sufficient cross-section to assure discharge of the water. Qw = Total Water and vapour flow rate in condenser in M3/sec. The velocity of water in the barometric column is maintained at 2 to 3 mtr /sec. So that the air bubbles do not escape and rise in condenser. They should pass along with water through tail pipe. For single entry type condensers it may take upto 4 to 5 mtr/sec. Wet air condensers : Condenser with combined vapour and air extraction. Dry air condensers : Condenser with separate arrangement for air extraction. In Barometric condensers having two types. They are Co-Current barometric condenser and Counter Current barometric condenser. Co-Current, barometric condenser water and vapour are introduced to the condenser from top and the worm water is let out removed from the bottom. Compared to the co-current type, counter current type barometric condenser works more efficiently. The condenser is a device for exchange of heat between vapour and cold water. The exchange will be the more complete as contact between these two fluids is more intimate. 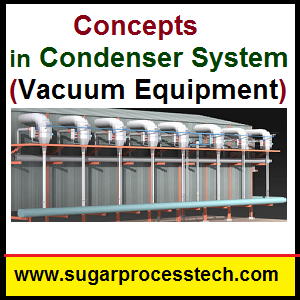 Height of Condenser is decided as per the time that is necessary for the water to remain in contact with steam. While proper arrangement of baffles in condenser to increase the contact area than the overall height of 3.65 mt ( 12 ft) is sufficient . The cross-section will depend directly on the quantity of vapour to be condensed. S = 0.16 m2 / ton of vapour to be condensed per hour. where S = horizontal cross-section of the body of the condenser. The condenser volume of 0.75 m3/ 1000 kg of vapour is recommended however 0.5 m3/ 1000 kg vapours can be considered as a reasonable figure for rain type condenser. 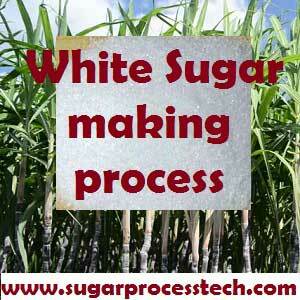 however, has determined experimentally that 0.6 m3/ 1000kg per hour was sufficient in most cases. In some designs provide maximum effective contact area of water to vapour in that design it will take 0.4 to 0.3 m3/ 1000kg per hour. The cone at the bottom of the barrel should have a slope of 70° to the horizontal. Jet condensers were first placed on the market by Schutte – Koerting about 1930. They are based on the dynamic effect of jets of water which, penetrating into the body of water in the barometric column, enter with them, by friction, the air contained in the condenser. If the cross-section of the barometric column is small enough to ensure a suitable velocity, the bubbles of air do not rise into the condenser and are evacuated to the well at the foot of the column. The main difference with the Multi Jet condenser is that, it does not require air pump, and although it requires more water than the dry air type condenser, it is more economical to operate and maintain. This type of condenser has high pressure water jet nozzles fitted in the lower section of the condenser, directed straight at the outlet or barometric leg. The vapor inlet to the condenser is from the top of the condenser much above the level of the jet. The nozzles are called as jet nozzles and they create vacuum in the system. The jet is given such manner, that the jet of water will flow exactly through the center of the tailpipe. On the top portion of the jet box another set of nozzles is fitted circumferential through which the flow of pressurized water is flowing towards the center of the box. This part of water is responsible for the condensation of vapour, which is called as spray nozzles. As against the dry air type, the Multi Jet differs (wet type) in principle that due to the high velocity of water passing down the barometric leg, air or gas bubbles will not rise but instead it will be drawn away through the outlet with the waste water. The pressure of water in both the parts to be employed as between 0.5 to 0.7 kg/cm2 for observing the pressure the gauges are fitted to inlet pipes. The proportion of the quantity of water is in ratio of 40% water to jet and 60% to spray. Quantity of vapour to condensed (Q) = Heating surface of the equipment x Evaporation rate. Cross sectional area of the vapour pipe = Quantity of vapour in M3/sec / Velocity of vapour in m/sec. Cross sectional area of the condenser =( Quantity of vapour in M3/sec + Quantity of inlet water to the condenser in M3/sec) / Velocity of vapour in m/sec. 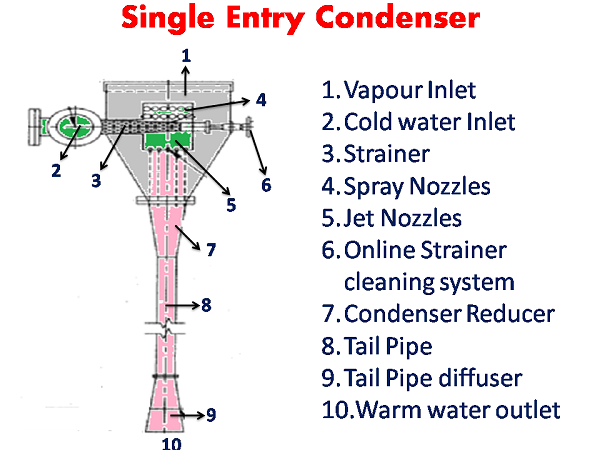 Single entry condensers are having only one water distributing box for spray and jet nozzles. Out of total water about 60 to 80 % water is used at Spray nozzles and 20 to 40 % water for jet nozzles. Vapours are condensed by forming fine mist inside the condenser, increasing surface area of contact and finally minimum requirement of water. The difference between approach temperature ( difference between vapour temp. and condenser water tail pipe temp) does not exceed 5 to 60C. The Specially designed high efficiency centrifugal spray nozzles fitted on the jet box create micro fine atomized spray, resulting into wider surface contact with incoming vapours. The difference between water outlet temperature and inlet temperature of 10°C is achieved. Under automation the difference can achieved upto 15°C. Single entry and Multi jet condensers are of Parallel flow type wet air condenser. The Single entry condenser requires less water than conventional Multijet condenser due to the following reason. In the single entry condenser design the spray nozzles are fitted in nozzle box which fitted at the center of the condenser. Thus the spray water covers all the available area inside the condenser hence the spray water particles contact area for the vapour condensation is more than the multi-jet condenser system. Another impotent parameter in this design tail pipe diameter and velocity of water in the tail pipe . 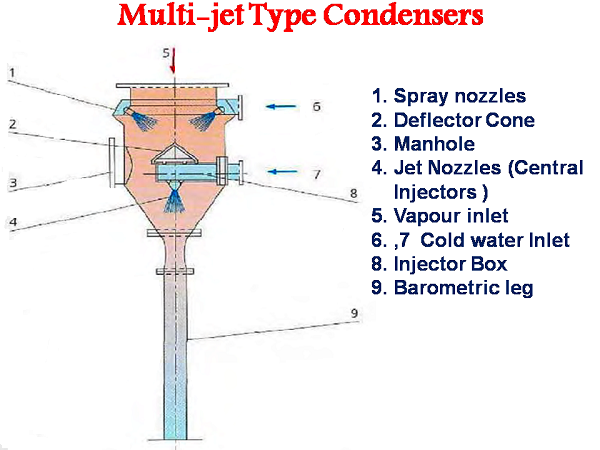 The nozzles dia calculation same as multijet condenser. The velocity of warm water (outlet water ) goes upto 4 to 5 m/sec. The design of bottom cone, its reducer and venture were placed important role. In a condenser the vapours entering, transfer heat to the cold injection water, the heat transmission depending on the temperature and quantity of water. Based on the heat balance the equation for arriving at the quantity of injection water is. 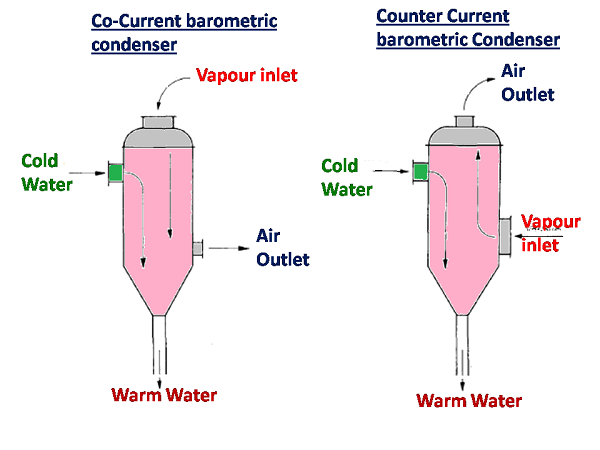 To = temperature of condenser outlet water in °C. According to E.Hugot the optimum value of this Ti and To difference is 10°C. The difference in temperatures of vapour being condensed and the outlet water termed as approach should be minimum since the efficiency of the condenser operation depends on the fact that minimum quantity of water should absorb all the latent heat of vapour. Under normal conditions the cooling water ratio to vapour condensed in around 50 to 60 for barometric condensers, 60 to 70 for Multi jet condensers and 40 to 50 for single entry type condensers. 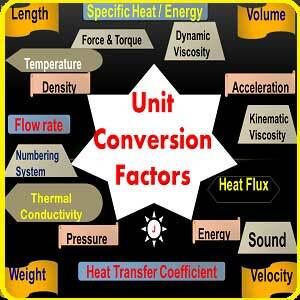 In the next revision of this article will provide online calculation sheet of condenser design. 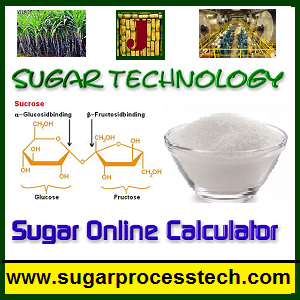 Solid Balance in Sugar industry process | Material Balance Calculation | Sugar Factory Material Balance Calculation for 3 m/c Boiling. Why injection pumps left the water in running mode? We shortly will publish articles on steam and water balance soon. Vacuum pump not suitable for vapor extraction. Sir i want reasons for All are maintain Clarifier (Dorr) compartment Height 1.5mtr. It is depended upon the settling rate and velocity of the juice inside clarifier. The speed of settling of an average juice is approximately 75 mm per minute, until the concentration of the muds near the bottom has reached a maximum. Bases on this Clarifier (Dorr) compartment maintained Height 1.5mtr. Please provide online calculation sheet for condenser design.